For sales led businesses having real time sales information available to managers will drive growth by helping motivate staff. By showing the right information we can maintain control, draw on the strengths and identify then take action against the weaknesses. How you present this data is key to making it demonstrate the positive and negative factors you want it to highlight. I am sure you have KPIs relevant to your function, but how often have you considered what a change in them means, what would trigger action and then what you would do about it? Whilst there are many exceptions we can consider most KPIs as either "trend based" or "comparison based". It&apos;s even possible for the same KPI to be presented in both ways. Trends look at a number over time. The time frame gives us context and allows the reader to make the decisions of what to do. Take this example of general sales figures versus target, the trend is generally upward until July-16 but then it dips suddenly. Firstly this chart is good because it show historical figures and therefore allows to not only to trend the results but make comparisons to previous months wicks enables us to see that July-16 looks out of place or extraordinary. 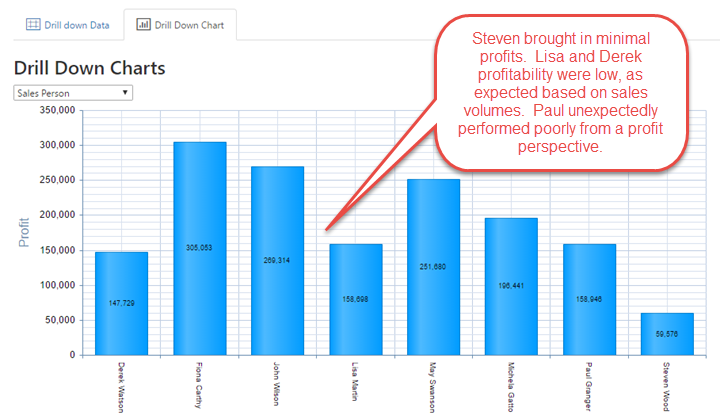 When designing any dashboard chart for sales figures it is important to consider what is the "message" you are trying to communicate then then what is the action you would take it if the KPIs are outwith your expectations. What Went Wrong in July? Undoubtedly your next move would be to investigate and the quicker you find answers the quicker you can implement strategies to avoid this happening again or rectify the current position. If you have a basic reporting or dashboard system then you are most likely going to have to trawl through a lot of excel data or pick up the phone to try to find out where the problem may exist. 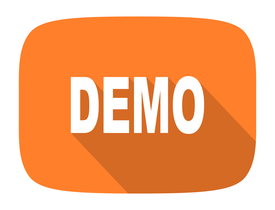 With more sophisticated dashboarding applications you are able to drill into the data. Drilling down might give us the detailed sales values, but this will still leave us with lots of work to do to find out what went wrong. 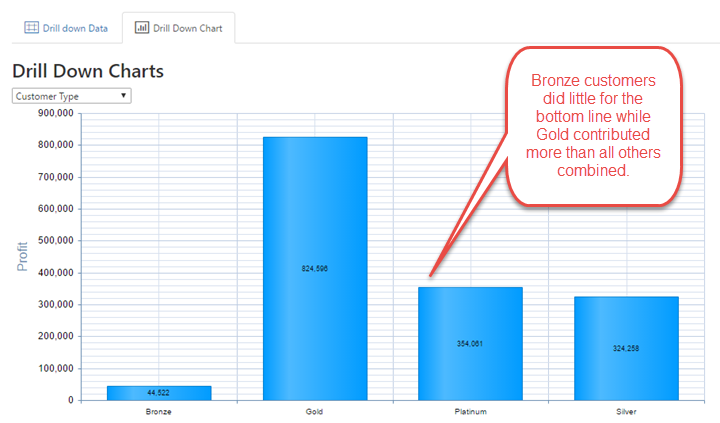 Tabular data drill-down is great for fine details, but chart drill-down views give us answers at a glance to questions such as, "What went wrong?" The next stage is to start to make some comparisons, again using the right dashboarding software this should be just a few clicks, otherwise you will need to put in a few hours work in excel. If you can generate some graphs based on these then you can compare the splits on this poor performing month. Explore performance quickly by changing between salesperson, location, region, customer type, profit, order value, etc. 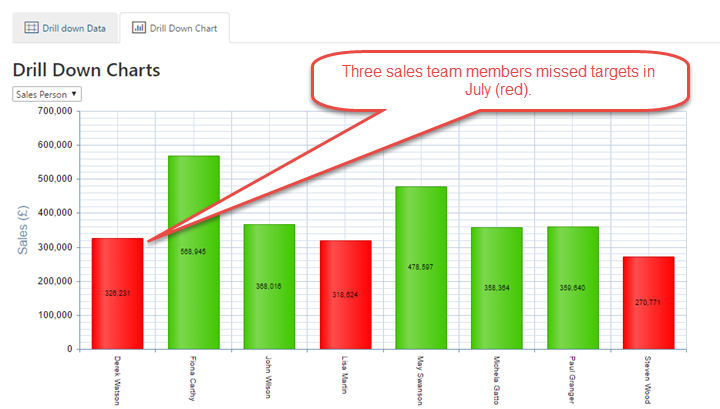 So let&apos;s graph July sales figures by Sales Person to see if there is anything that looks out of place? …or perhaps its one of our product ranges or types of customers that has underperformed, so see the same data by "customer type"
Performing above sales targets doesn&apos;t always mean contributing significantly to the bottom line, such as when those sales are at a loss! When building any graphs on your sales reports or dashboards always give some thought to why you are presenting this chart, and how you will highlight the "message" that the KPI is out of the ordinary. Finally always consider what action the reader might take when a problem is highlighted, so making quickly accessible visual drilldowns of the problem data allows the reader to quickly narrow down the problem and take action leading better sale performance. See how you can use Target Dashboard to gain a competitive advantage as your team beats target month after month.